One of the most feared ramps of the Tour of Flanders, the Koppenberg is 600 metres of cobbles. It comes as the ninth climb, after 181km, so it is not usually a launchpad for the win. But it is highly strategic. 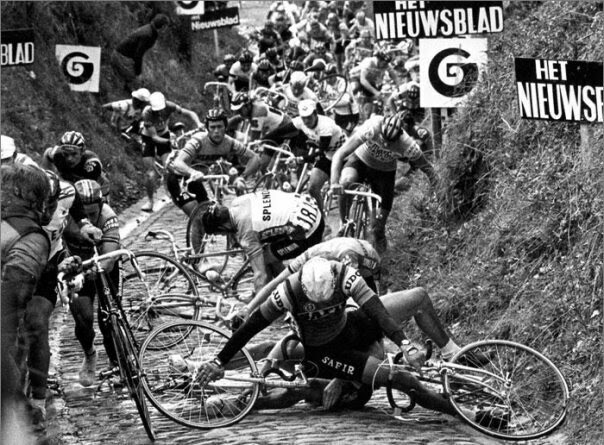 The photo above is one of many from over the years, crashes are common the slippery cobbles and many have to complete the climb on foot. Lose momentum, lose the race. Indeed the climb was removed after the 1987 edition and didn’t return until 2002, after it was resurfaced and widened. Even then it only lasted a few years before it was again avoided. But it’s back on the parcours. The difficulty lies in the gradient, maxxing at 22% for a moment. Now that’s fiendish on a tarmac but you have to try it on the cobbles just to believe it. Then give it a go when the kinderkopjes are wet. It is very steep but get out of the saddle you lose the rear wheel and can slip. Its name means “Heads hill”. The road is a track that, over hundreds of years, has seen the weight of feet, hooves and wheels cut into the hill. Now it acts like a ditch and is often wet, run-off water from the farmland drains onto the track. By the 1970s Belgium was updating much of its road network, including tarmacking many of its cobbled roads. So the hunt for hellingen was on. For years the Koppenberg climb was merely a farm track, including a cobbled section. Because of its rough surface and steep slopes few used the route, as a result almost no one knew about it. It seems hard to imagine people missing a road but it just an old farm track that was best avoided. As they toil up, the riders can thank Hubert Hoffman, a resident of Melden. It was he who informed race organisers about the hidden track and it was duly included in the race in 1975. But it was kept secret for some time by none other than Walter Goodefroot, winner of the Ronde in 1968 and 1978. He used it in training but did not want to tell others about the road, “I didn’t want to have this sort of climb in a race” he told L’Equipe. As much as the climb is now part of cycling legend, it has only been used 21 times in the race but that means it still gets into the top-10 of most used climbs. Now it is a celebrated part of the Flemish landscape and contributes to the local economy with many cyclists making a pilgrimage to the town of Oudenaarde in order to try the infamous slope for themselves and visit the local Ronde van Vlaanderen museum, which celebrates the race. Never raced up it, but ridden it a number of times in bone dry and sunny conditions and also in sleet/snow as part of the sportive before RVV race day. It STILL gets the pulse rising as you round the last couple of corners and then hang the sharp right to start on the lower slopes. Doable in the dry, almost unrideable in the wet with other riders all around. Great fun all the time and great satisfaction if you ride it clean. The only thing that strikes fear more than the Koppenberg is the cobbled descent of the Kemmelberg (which is no longer used)! Mark W: yes, if one rider loses it, then many will also get taken out. Yves: me too. The race director had to run over his car as the rest of the race was approaching. Touriste-Routier: that’s a bad one, the rattling of bikes, bouncing water bottles and a tricky balancing act. I remember Jimmy Casper having a bad fall there. Stupidest thing I ever did was descend the Koppenberg. And I thought my day going down the Kemmelberg was bad. Touriste-Routier is right, there is no need for descending on cobbles in a race. I do have a story about climbing the Koppenberg though. I was staying in Oudenaarde and a group of five Norwegian amateurs (elite zonder contract) were staying at the Hotel Tijl down the street. We all decided to do a big 5 hour loop taking in every climb in the area. Right off the bat we start up the Koppenberg w/ barely a warmup and on wet conditions. Out of the 6 of us, only one made it to the top without clipping out, or busting a gut laughing at how ridiculous this adventure was. Of course that guy went on to be World Champion in 2010. Probably didn’t help that most of us had low gears of 42×21 and the Thunder God just happened to be running a 39×23. All I could think was, man I can’t imagine how they ever used to race up this thing with a pack. All a good teammate would have to do is clip and block the road for his leader who was going away. Then a few years later, voila, they put that stupid thing back in the race. Hahahaha, to all the pros who decided to be a pro. I’m actually considering taking a cheap 1 day holiday consisting of taking the eurostar from London to Brussels and cycling from Brussels to Lille via the Koppenburg & Roubaix. I can then get the eurostar back to London! On a business trip to Belgium, my client hooked me up with two employees who were riders. Skipped out at lunch to ride the choice hellingen of the Ronde. My rented bike was under geared at 39×25. At 42, I needed all the bullets I could get. Taking the hard right hander and seeing the Koppenberg rear up in front of me was awe inspiring. Never thought I would make it. Out of the saddle, chest way over the bars, lungs seizing, snot bubbling, I grunted my way to the top. Thank God it was dry. It wasn’t pretty but I made it – didn’t ride the smooth gutter and dropped one of my twenty-something guides. I could die happy. 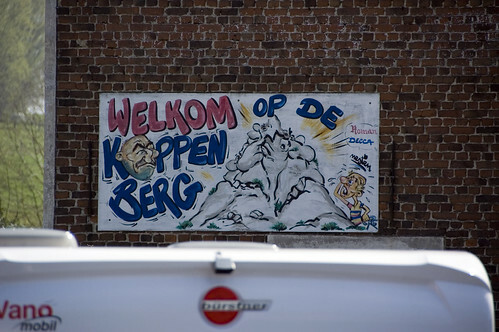 The Muur was equally thrilling/savage but the Koppenberg will be with me forever. Cannot wait to watch the spectacle on Sunday. I can still remember being on the Koppenberg, at the age of 12, when Skibby’s bike got run over by the race director’s car. The booing from the crowd was everywhere and now I know that most people were (and probably still are) there for the race, no matter who’s leading. Every rider deserves a fair chance. Gaving: let us know how you get on. Hungryjobs: yes, it’s a famous story by now. Poor Skibby is almost famous just for that. He was probably the Voigt of his day, a big rider ready to attack.